MagLite® M2A Flashlight and Leatherman Rebar with your Corporate Logo! 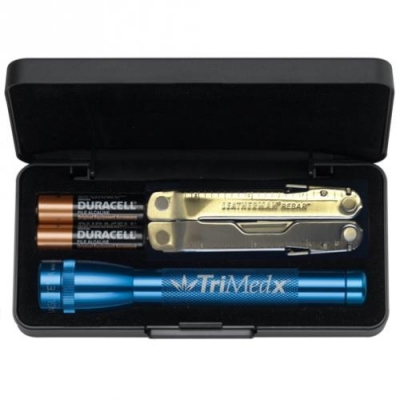 A Mag-Lite® and Leatherman® gift set that will be appreciated by your staff or customers. Mini Mag® and Leatherman® Rebar, with your logo. Tool is 4" long when closed. Package includes 2 “AA” batteries and gift box. Your choice of Mag-Lite® color. Prices Include Laser Engraving on Both Items. Color: Gray, Black, Red, Blue, Pink, Green and Navy. Blade 5/16"H x 1 1/2"L; Handle 1/4"H x 1"L.